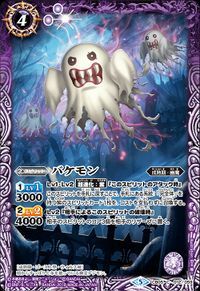 A ghost Digimon completely covered by a cloth over its head. As it is a wicked being born from darkness, it is said that computers possessed by Bakemon instantly have their systems destroyed. Everything within the cloth is wrapped in mystery, and it is rumored that a portion of the shadow of its true form has become a black hole. It dislikes direct attacks because its fighting strength isn't great. Its Special Move "Hell's Hand" pulls the captured enemy all the way to hell. Also, its "Death Charm", which casts a powerful spell, seems to bring annihilation in a matter of seconds unless they are the possessor of a tenacious spirit. 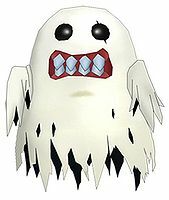 A ghost Digimon completely covered by a cloth over its head. As it is a wicked being, born from darkness, it is said that computers possessed by Bakemon instantly have their systems destroyed. Everything within the cloth is wrapped in mystery, and it is rumored that a portion of the shadow of its true form has become a black hole. It dislikes direct attacks because its fighting strength isn't great. Its Special Move "Hell's Hand" pulls the opponent to hell. 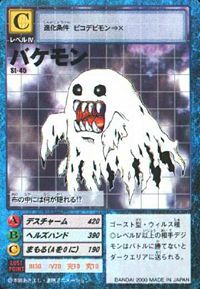 Born from the Dark Area, which exists in a spatial distortion, it is a wicked Ghost Digimon. 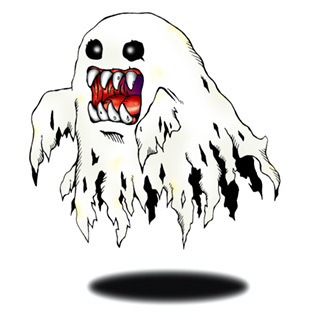 As a Ghost Digimon, its Level is low, but because its body is composed of a fiendish virus program, it is said that computers it possesses are pulverized in a flash. 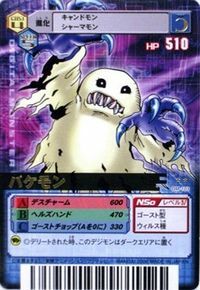 Everything underneath its cloth-like skin is wrapped in mystery, and this Digimon is so mysterious that it is rumored that a portion of the shadow of its true form has become a black hole. Because its fighting strength isn't great, it doesn't attack directly, but is instead an expert in indirect attacks employing curses or magical power. 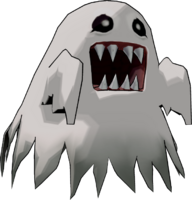 Its Special Move, unlike the Bakemon of File Island, is to cast a death spell on the opponent (Death Charm). For those who incur this death sentence, it is said that annihilation comes within five turns. 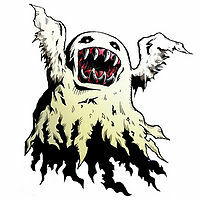 A ghost Digimon completely covered by a cloth over its head. As it is a wicked being born from darkness, it is said that computers possessed by Bakemon instantly have their systems destroyed. Everything within the cloth is wrapped in mystery, and it is rumored that a portion of the shadow of its true form has become a black hole. It dislikes direct attacks because its fighting strength isn't great. Its Special Move "Hell's Hand" pulls the captured enemy all the way to hell. 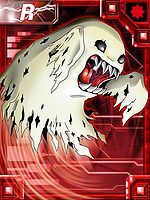 A ghost Digimon completely covered by a white cloth over its head. No one knows of its true form hidden underneath its cloth. — Digimon Adventure: "The Dancing Ghosts! 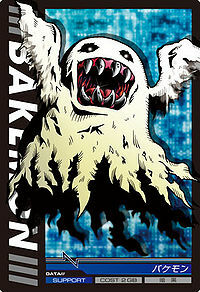 Bakemon"
A ghost Digimon completely covered by a cloth over its head. Its true form is still wrapped in mystery. Its Special Move is "Hell's Hand". — Digimon Adventure 02: "The Digimon Kaiser's Loneliness"
A wicked Ghost Digimon born from the Dark Area, which exists in a spatial distortion. 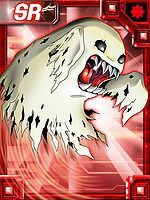 As a Ghost Digimon, its Level is low, but because its body is composed of a fiendish virus program, it is said that computers it possesses are pulverized in a flash. 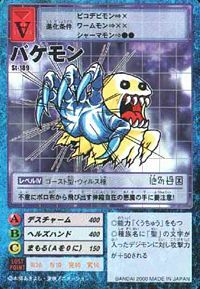 This Digimon is so mysterious that the structure of its body is nothing more than gossip. Because its fighting strength isn't great, it doesn't attack directly, but is instead an expert in indirect attacks employing curses or magical power. n., From Bakemono 「化け物（バケモノ）」, which means ghost or monster. 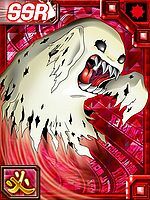 Anime/Manga Digimon Adventure: "The Dancing Ghosts! Bakemon"
3.1.4 Digimon Savers 3D: The Digital World in Imminent Danger! Hell's Hand  ヘルズハンド Heruzu Hando Dark Claw/Zombie Claw/Night Claw Extends a giant decaying hand from underneath its cloak to attack the enemy. Death Charm  デスチャーム Desu Chāmu Evil Charm/Death Charm/Dark Charm Casts an evil spell of darkness that washes over the enemy and saps away its life. Emits a dark wave that hypnotizes the enemy, amplifying their doubts and driving them mad. Blows out a poisonous smoke. Bakemon are among the residents of Overdell Cemetery on File Island and scared the Chosen Children. Vamdemon also used many Bakemon as its soldiers and used them to round up children while they were in the Real World to try and determine which one was the eighth Chosen Child. Several Bakemon appear as slaves of the Digimon Kaiser, being under the control of Evil Rings. A Bakemon was the underling of Lord Vamdemon. It was able to disguise itself as a Patamon. 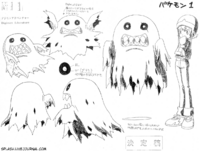 Bakemon appears as an obtainable Adult-level Virus type Digimon in Digimon World. 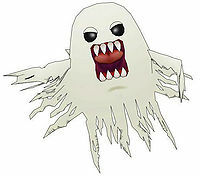 All 9 Child Digimon can evolve into Bakemon via Death Evolution, which its triggered by losing a battle, though this only has a 10% of chance to happen so its reccomended to save the game before trying to do the method. Bakemon are among the residents of Overdell Cemetery, though there's one in particular special... It speaks in a different language, making it impossible to understand, however if you bring another Bakemon as a partner, it'll translate the language for you, as he's asking questions and if you answer them all correctly, it joins the city, patrolling the city at night. After Vamdemon went missing, the Player has to go to the Dark Lord Mansion's secret Lab and will find both Vamdemon and Bakemon which were kidnapped and held in a cage by Skull Greymon. After the player defeats Skull Greymon, Vamdemon and Bakemon will be freed, unlocking Vamdemon as an opponent in Greymon's Tournaments. Bonus conditions: Have a Happiness of 50% and have at least 28 different techniques mastered. Bakemon's Digivolution item is the Torn Tatter which lets any Child Digimon evolve into Bakemon. Scumon (When its Poop Gauge is full). Vademon (When you scold it when its age reaches 15 days old, though this has a 50% chance of happening). 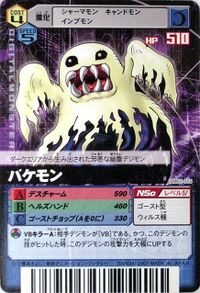 Upon contact with the enemy, dark energy surrounds Bakemon and it unleashes the energy in the shape of a black ominous hand that slashes the opponent. Bakemon evolves from Tukaimon with 0-2 DP and evolves into Fantomon with 0+ DP. 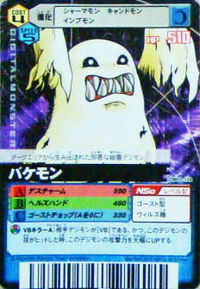 Bakemon appears as an opponent and an obtainable Black Card. Appears as a field enemy. Bakemon is one of the balloons in the Twisted Toy Town stage. Can be evolved from Goburimon if above level 14, or can be found at Chrome Mine. Can be evolved from Tukaimon if above level 19, and Dark EXP above 420, or can be found at Thriller Ruins. Can evolve to Phantomon if above level 34 and Dark EXP 4200. Bakemon is an obtainable evolution of Lalamon. A Bakemon was reported causing an electrical disturbance in Sneyato Forest. During battle, it evolved to Vamdemon. Evolves from Tukaimon, Bakumon, Hagurumon, Pico Devimon, Falcomon or Yuki Agumon. Can evolve to Death Meramon or Fantomon. Bakemon is an unobtainable enemy Digimon. It is only obtainable as a collectible card. After you have evicted the Fluorescent Cave mansion's previous resident, Platinum Numemon soon realizes that its new home is haunted at night, and refuses to set foot in the mansion until it's safe. When Taiga then checks the mansion at nighttime, he finds Bakemon, who once again speaks using only his name (eg. Bake bake?). If Taiga answers the questions correctly, Bakemon will join the city, but if answered wrong, Taiga must fight and defeat it before it will join. Patamon: 4+ Calls, Train 32+, Overfeed 3+, 0-6 Sleep Disturbances. Kunemon: 4+ Calls, Train 8-15, Overfeed 0-5, 5+ Sleep Disturbances. Can be evolved to Giromon. Bakemon evolves from Pico Devimon with 3+ Calls, Training -24 times. Can be evolved to Vamdemon with 1 or less calls, Winning percentage: 40% or higher, Training 40+ times, Battle 30 times. 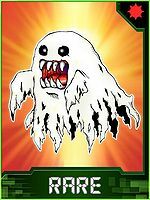 Can be Jogressed with compatible Digimon to obtain Pumpmon or Fantomon. Bakemon is an enemy Digimon in Area 03 and 04. Evolves from Elecmon, Falcomon, Goburimon, Kamemon, or Kudamon with 0 DigiSoul or Reliability 0-10. Can evolve to Blossomon, Megalo Growmon, Shawujinmon, Tyilinmon, or Yatagaramon. What hides within its cloth!? Beware of the extendible demonic hand that reaches out from its old rag without warning! This pilot of the underworld guides its possessed enemies to hell! A ghost Digimon born out of the Dark Area. Being made out of a virus program, it destroys computers one by one by possessing them. It is said that beneath its cloth lies a black hole. 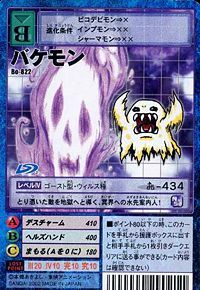 A ghost Digimon completely covered by a cloth over its head. ↑ Digimon Adventure V-Tamer 01: "Combination Breakdown"